The El Jefe was amazing.... great portions on the pulled meat, excellent spice and the pickled onions rounded the sandwhich out perfectly. 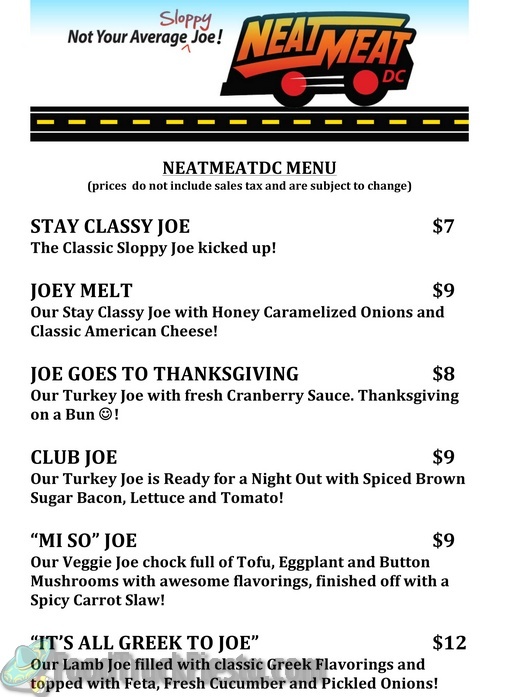 The Joey Melt was a classic Sloppy Joe with a slice of sheet cheese and the slight touch of carmelized onions. This was thoughtfully carried out like you would at home. Both sandwhich had an amazingly soft kaiser type roll that drank up the sauce that accompanied the meat. Service was great and I only waited a couple of minutes. All in all... You'd be happy to have some Neat Meat. Didn't know what to expect from this truck, but I was pleaseantly surprised. The sandwhich had a very good amount of meat, which was very flavorful with a nice kick to it, but not overpowering. The potato roll was very fresh. Overll very good and satisfying. I will purchase from them again. First time at this truck today at Patriots. I wasn't sure what to expect, but must say I was pleasantly surprised. Service was prompt and efficient -- food was hot. I ordered the classic. The bun was fresh and the meat filling was plentiful and very nicely seasoned with a hint of sweetness at the end. They were out of beverages when I arrived at 1pm. I thought it was a nice change for lunch, and did enjoy it. I will stop by again. I visited this truck during TRUCKEROO (June) and I'm sure glad I did!!!!!!!!!!! Great FOOD, Great SERVICE!You guys have a customer for life! I visited this truck during TRUCKEROO (June) and I'm sure glad I did!!!!!!!!!!! Great FOOD, Great SERVICE! You guys have a customer for life! First time at this truck. With only 5 people in front of me, I didn't expect it to take over 40 minutes to place and receive my order. 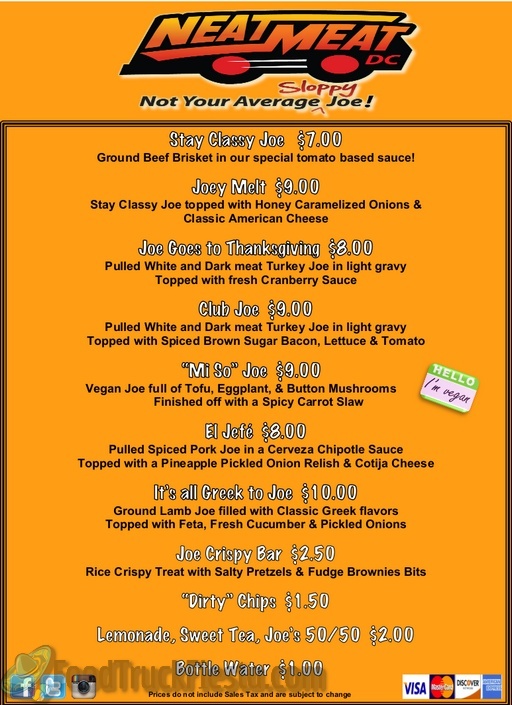 Sloppy joe was ok - not great, not horrible, just ok. Won't try it again. Sandwich was very tasty, but a bit pricey. Lemonade kinda weak. Not a big fan of the ordering system and the lady taking my order was cranky. Not a fan, but it was certainly not bad food. 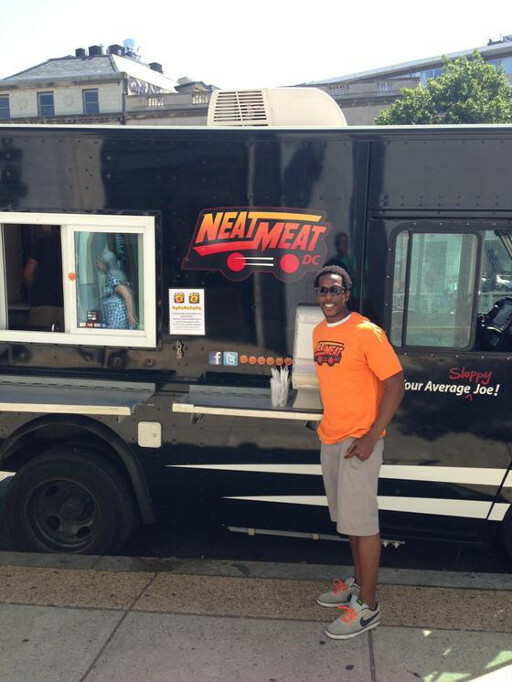 NeatMeat serves high quality Sloppy Joe sandwiches, bagged chips, and beverages. The launched on May 31, 2013.